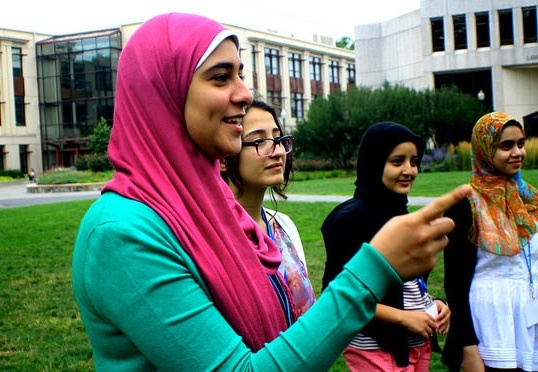 U.S. Department of State program empowers girls from the Middle East and North Africa to pursue futures in science and technology. Washington, D.C.— 27 young women from seven countries in the Middle East and North Africa will arrive in the Nation’s capital on July 21 for the U.S. Department of State’s three-week TechGirls exchange program. Building on the U.S. global commitment to advance the rights of women and girls around the world, the TechGirls program provides the training and resources needed to succeed in the technology field. Since the inaugural year in June 2012, approximately 80 teenage girls (ages 15-17) have travelled to the United States to participate in the program and have trained more than 2,300 peers upon return to their home countries. Beginning on July 21st, the newest group of tech-savvy teenagers from Algeria, Egypt, Lebanon, Morocco, Palestinian Territories, and Tunisia will dive into an intensive program. Legacy International designed a cultural immersion experience packed with hands-on skill development workshops, opportunities to engage with America’s most innovative tech professionals, and 50 hours of study at iD Tech Camp, an interactive technology and computer camp. The TechGirls will receive training in leadership and project management through clinics focused on design thinking, action planning, and everything in-between. Additionally, they will participate in a day of job shadowing with top tech companies in the D.C. area, and will be advised and mentored by leaders in the STEM fields throughout the summer. Working with top leaders in the tech industry and social entrepreneurs representing both the U.S. and MENA regions, the girls will make invaluable personal contacts, become part of a supportive and expansive network, and acquire the skills needed to compete effectively in a male-dominated field. The U.S. Department of State has teamed up with both public and private sector partners for this program, including: AT&T, Bully Pulpit Interactive, Girls Who Code, Goodwill Industries, National Building Museum, 18F, Yahoo!, Facebook, Tech Change, Relief International, Echo & Co, Synopsis, the FCC, CNS and iD Tech. Join the conversation on Facebook, Twitter @TechGirls and #TechGirls, Tumblr, and Instagram @TheTechGirls. For more information, please contact Jennifer Addison of TechGirls. You can also learn more about iD Tech on Facebook, Twitter @iDTechCamps, and Instagram @iDTech.